To no surprise, President Obama announced today he’s running for re-election. It was, of course, just a little over two years ago that Obama was swept into office in a tide of clamor for change that — you may recall — led people in Minnesota to stand in a line that stretched for nearly two miles to hear him speak during a campaign stop. His election left the “experts” wondering if the Republican Party could ever recover. But as winning parties usually do, the Democrats overplayed their hand, confident that they spoke for all Americans. It’s a good time to hit the News Cut Wayback Machine. Set the date for January 20, 2009. A government shutdown looms on Friday. Our workers are no less productive than when this crisis began. There were 154,185,000 people in the labor force in January 2009. As of the end of March, there were 153,406,000 in the labor force. The number of people without health insurance dropped for the first time in 23 years, the Census Bureau reported last fall. The U.S. is scaling back its human spaceflight program. A 2009 Obama order expanding research using embryonic stem cells was overturned by a federal judge. An appeals court lifted the temporary injunction pending further review. President Obama announced his plan for energy independence in a speech six days after his inauguration. Late last month, the president also gave a speech outlining a plan to reduce dependence on foreign oil. His administration also approved a large wind farm project off Cape Cod. The Republican victories last November — at least in Minnesota — were ripped from the playbook of 2002. The victories on a national scale mirrored the 1994 Contract with America. Congress is about to kill data.gov. The president failed to get cap-and-trade legislation through Congress and his relationship with environmentalists is on thin ice, according to Politico. A month after his speech, Obama promised to remove most troops from Iraq by December 2010, leaving 35,000 to 50,000. As of January 2011, 47,000 U.S. troops were in Iraq. There were 135,000 U.S. soldiers in Iraq during fiscal year 2009. President Obama’s approval ratings are hovering around 48%, according to Real Clear Politics. His negatives are about 46%, way up from the 20% of Inauguration Day. That’s still a significant difference from the 65% negatives of the last days of the Bush administration. It’s halftime for the Obama administration. What locker-room speech would you give? As a progressive, I find his policies a mix of disappointing and acceptable. Certainly I appreciate his efforts to end DADT and DOMA, while being disappointed in his military policies and his continuation of Bush-era crimes like Gitmo and habeas corpus. But his economics are where his poor performance hits reality – his right-wing economic team and Wall-St.-friendly policies are making this the softest and least robust of economic “recoveries.” If Obama were implementing actual economic changes, such as encouraging U.S. manufacturing and penalizing businesses that offshore labor and profits, then we’d be seeing an actual economic comeback. And if he prosecuted Wall Street insiders instead of putting them on his cabinet, he’d be enjoying a lot more popular support. Obama gets a C+ from me as a president, and an F as a progressive. Interesting chart you’ve got there Bob. The government says worker productivity increased from 2009 to 2010, which clearly shows why a bar graph can be incredibly misleading. 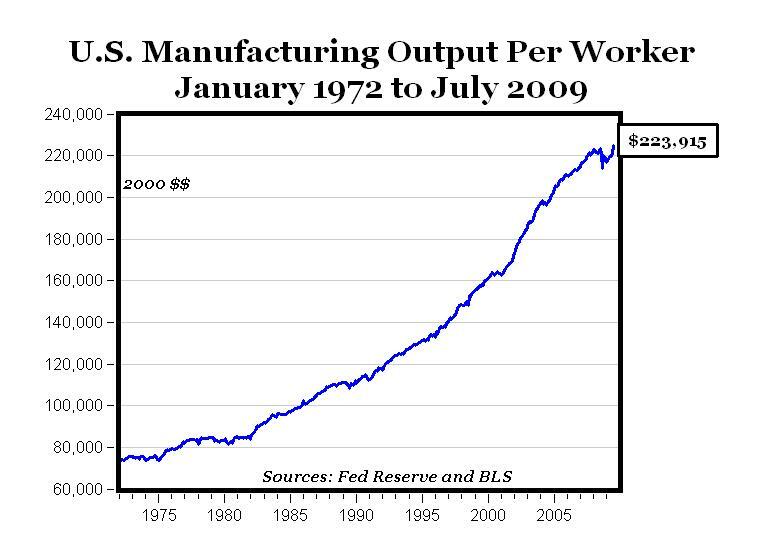 From the time I graduated high school in 1971 until the present, American workers’ productivity has gone up, up, and up. 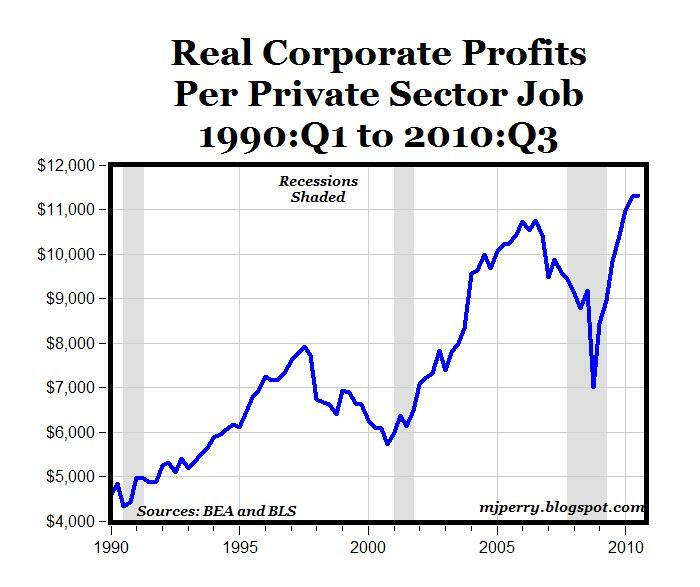 Or you can take the corporate POV and look at profits, but either way it’s clear that the bar chart you’re using grossly distorts the political implications of how our economy has grown. I doubt very much I’ll be voting for Obama in 2012, but any analysis of his performance that in any way makes Bush look good is flawed. George Bush took a thriving economy and drove it into the ditch. That Obama comes out badly in your bar graph simply shows that bar graphs can grossly distort what actually happened. It’s fine to be a contrarian, but that graph and your figures go well beyond contrarian and grossly misstate what’s happened to our economy. We overpaid our CEOs to a ridiculous extent, let Wall Street make up their own rules, and allowed the wealthy to spend obscene amounts on political campaigns. We’re not struggling because Obama got elected, we’re struggling because he’s not working hard enough to undo the damage done by Bush. I would encourage any Democrat reading these comments to consider voting against Obama at their 2012 caucuses. We need a Democrat in the White House, but instead we’ve got a pro-Wall Street “centrist,” and that’s just not good enough. @Albatross: If you thought you were electing a “progressive” President then you spent too much time listening to the partisan media outlets on both sides that portrayed then Senator Obama as far more liberal than most neutral analysts found him. Of the two candidates left standing at the end of the primary season in 2008, Senator Clinton was by far the more liberal. @Mark Gisleson: You’ve got a Democrat in the White House. The last three Democratic candidates to win the Presidency have all been “centrists”. I would put Obama to the “left” of Clinton and about equal with Carter. Looking at the other numbers Bob provided it looks like 6% of the voters will determine the actual outcome if the positives and negatives stay the same. The good news for Obama is that he only needs to swing half of them to win. The question I have for people who consider themselves progressives or liberals or whatever label you choose (I’ve always considered myself a liberal, I almost declared for the Liberal Party in NY when I first registered to vote), if the choice is Obama or Pawlenty or some third party candidate, who would you vote for? How about posting George W’s promises and accomplishments so we can do some comparing? Also, can we postpone some of this discussion until there is actually a Republican opponent? Will any presidential (or congressional) candidate actually bring up managing the costs of defense, medicare/medicaid, and social security?